What if your luggage was made with the 21st century in mind? Well, the Bluesmart smart carry on is just what the doctor ordered. It is a massive leap in luggage technology that will feel at home with your iPad and other gadgets. Business travelers rejoice! You now have a new favorite carry on bag! This is our Bluesmart Black Edition International Luggage review. If you are even remotely a techy person, this bag will be a revelation. The battery alone justifies this purchase. But the fact that this bag is also a very well made bag just seals the deal. We all carry around gadgets with us at all times. And because of this we all have constant battery anxiety. What if I miss that important email because my iPhone or Samsung Galaxy runs out of battery? For frequent travelers power outlets are like gold. You will see folks tethered to the wall all over the airport, grabbing just enough juice to keep their laptops, tablets and phones going. But what if you could untether yourself from power outlets while traveling? That is the philosophy that Bluesmart put into their wildly popular Bluesmart smart carry on bag. Their bag is packed with enough battery power to recharge your mobile phone a whopping six times. That’s right, you can now simply plug your phone into a USB plug on your carry on bag. This is revolutionary! Not only that, but Bluesmart has truly made your dumb luggage smart luggage. They have integrated GPS and 3G tracking of the bag. This means that via their phone app, you can track your bag if it gets lost. Lost luggage will now be a thing of the past. We never got a chance to test out this feature in a real scenario, but in our test around the office the app was indeed able to track the bag on both 3G and GPS signals. And if that’s not enough, the Bluesmart Black Edition International Luggage can even be locked remotely! Forget your bag at the hostel and remember that you left some valuables in it? Don’t worry about it. You can set the bag to simply lock itself when your phone moves far enough away from it. Nobody will be snooping in your luggage. These three features make this the most technologically advanced carry on luggage we have ever seen. And if you are a techy, this bag will drastically change the way you travel with gadgets. Not into all of this techy stuff? How about just a really excellent carry on bag? Check out our review of the Briggs & Riley Baseline Domestic carry on. Not only is the Bluesmart international carry on smart, but it is also incredibly durable. Bluesmart made the bag out of a great Makrolon material. This is very similar to a ballistic nylon and it really handles bumps and scratches nicely. In our tests on several airlines this bag didn’t come out with one scuff or rip. The hubless wheels that Bluesmart put on this bag are incredibly smooth and remind me very much of the Briggs & Riley Baseline carry on. And this is a good thing. This bag is a standard 22″ x 14″ x 9″ carry on size. But Bluesmart was able to pack a full 34 litres of room into the bag. This is impressive considering the bag also contains batteries and tracking technology. They use reinforced nylon on the front pocket where most people will choose to store their laptop or tablet. In our tests the pocket performed well and easily accommodated our 13″ Macbook Pro. 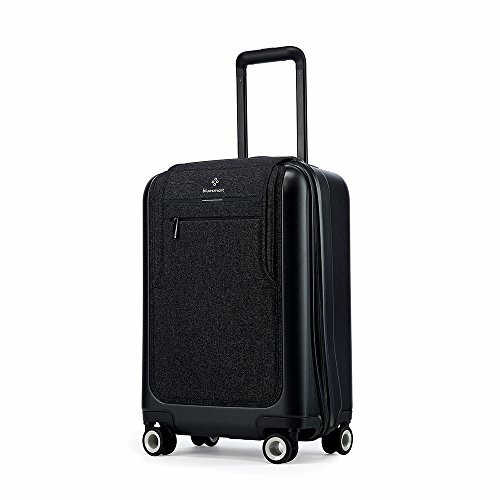 The Bluesmart Black Edition International carry on is part of our list of the best luggage for international travel. Check it out of you want to check out the other finalists. Bluesmart provides a full 2 year warranty on this bag. While not the best in the business, we have heard good things about their customer service. Since they are a newer company they are definitely trying to keep their growing fan base happy. In terms of value, this bag hits it out of the park for those of us that love tech. Bluesmart Black Edition International Luggage review: Should I buy this bag? If you often find yourself in need of power for your electronics while traveling then this bag is for you. The convenience of not needing to find a power outlet in the airport or at the hotel is incredible. And the added locking and tracking features make this bag one of our favorites in years. If you don’t need any of these bells and whistles we’d probably stick with the Briggs & Riley in the high end or the TravelPro Maxlite 4 in the lower end.